Efforts to sequence a large number of human cancers have provided a rich catalog of the most common genetic alterations that drive cancer initiation and maintenance. This mutational landscape has led to the identification of novel targets for therapeutic interventions. Replication, validation, and relevance are all essential tenets of science. Standard Operating Procedures (SOPs) address the issue of technical reproducibility by providing clear, concise, and detailed instructions for execution of an experimental protocol. Consistent methodology is the unheralded structural support for any high caliber scientific publication. Reproducible data relies on consistent methodology to remove any confounding variables. This is all the more important when multiple laboratories or sites are producing data that is meant to be compared and contrasted. Greetings, my name is Freddie L. Pruitt III, Ph.D., and I am the Communications Manager for the Office of Cancer Genomics (OCG). My love for research started soon after stepping foot on my undergraduate campus. Jaime M. Guidry Auvil, Ph.D.
September was Childhood Cancer Awareness Month, which inspired us to reflect back on the multiple successes that OCG’s TARGET (Therapeutically Applicable Research to Generate Effective Treatments) initiative has made towards the advancement of pediatric cancer research and treatment. About 20% of pediatric cancer patients do not respond to standard therapy and ultimately succumb to their diseases. Current treatments are toxic and particularly harsh on growing children. Survivors are often impacted by onset of secondary cancers, developmental delays, physical and emotional health issues, and infertility. Current treatment protocols are mostly derived from therapeutic regimens that were formulated for adult cancers. Previous studies revealed that childhood cancers are often genetically distinct from their adult counterparts, suggesting the need for alternate treatment approaches. The TARGET initiative set out to improve patient outcomes through a collaborative team science approach. Individual disease project teams are composed of clinicians, genomics experts, laboratory and data scientists; many of whom are members of the Children’s Oncology Group (COG). COG, is a cooperative group devoted exclusively to pediatric clinical trials, provided the TARGET project teams access to high-quality tissue samples with clinical annotation, as well as the potential for rapid translation of molecular findings into novel therapies. TARGET researchers have worked together within and across disease projects to successfully generate, analyze, integrate, and interpret high quality, comprehensive genomics, transcriptome and epigenomics data. TARGET project teams have made significant discoveries and translating some that are clinically-actionable (for personalized and/or targeted therapies) for patients. Examples to date are highlighted below. Comprehensive analyses suggests Wilms Tumor (WT) results from key genetic changes in a limited number of renal developmental pathways. TARGET project teams continue to address challenges of pediatric cancers through mining and analyzing the data. They are completing trans –TARGET analyses (together with informatics experts at St. Jude’s Children’s Research Hospital and Children’s Hospital of Philadelphia) to uncover somatic and germline alterations both within and across the various childhood cancers studied. Manuscripts are being finalized, and all TARGET datasets (open and controlled access tiers) are available for the research community to mine through the TARGET Data Matrix. Sequence data can be accessed from NCBI’s Sequence Read Archive (SRA), as well as NCI’s Genomic Data Commons (GDC) with approval through NCBI’s database of Genotypes and Phenotypes (dbGaP). The successes of TARGET will continue to expand the biologic knowledge of and potential therapeutic intervention for pediatric disease when the larger community comes together to collaborate and work across all available resources. To find out more about the TARGET Projects, please click here. Efforts to sequence a large number of human cancers have provided a rich catalog of the most common genetic alterations that drive cancer initiation and maintenance. This mutational landscape has led to the identification of novel targets for therapeutic interventions. However, mutational status alone is not sufficient to define the oncogenic state of a cancer. It is also becoming increasingly evident that there is a widespread biological and clinical heterogeneity in tumors, even when they share the same driver oncogene mutation. Some studies suggest that transcriptional activities like epithelial-mesenchymal transition lead to the variability of clinical responses. In a similar way, the wide variability of clinical responses to immunotherapy and the onset of immune escape are becoming formidable obstacles to fully realize the potential of new and potentially effective immunotherapies. This variability of clinical responses is likely due to the existence of several distinct oncogenic cellular states resulting from the interplay between oncogenic activation, baseline cellular context, additional molecular events, specific nature of the tumor microenvironment, and immunologic factors. Hence identifying multiple cellular states associated with an oncogene activation is essential in delineating cancers and developing effective treatment strategies. An oncogenic state is a set of specific and coordinated patterns of aberrant activation or deregulation of signaling pathways, downstream effectors, transcriptional and epigenetic events, and the tumor or immune microenvironment. These patterns result in similar phenotypic characteristics and cell vulnerabilities, such as genetic dependencies and sensitivities to pharmacological and other types of immune perturbagens. These oncogenic states focus more on the cancer’s vulnerabilities, rather than on traditional cancer classifications based on the anatomic site of tumor development, tissue of origin, or the mutation status of known driver genes. The establishment of an oncogenic state is a complex biological process. Despite this complexity, there is accumulating evidence of a functional convergence where many alternative paths led to a few genetically complex, but functionally similar, steady oncogenic states. The Tamayo group at the University of California San Diego has developed a combined experimental and computational methodology to define “oncogenic states”1,2. Onco-Genic Positioning System (Onco-GPS) is an analytical approach that can be used to identify oncogenic states and characterize them in terms of their most salient genomic and immune hallmarks. 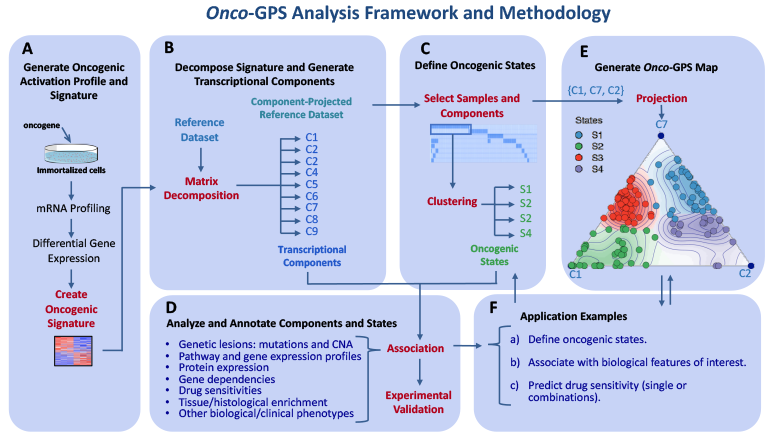 Onco-GPS uses a data-driven framework (Figure 1) to organize individual tumor samples with shared oncogenic alterations onto a reference map defined by their oncogenic states. It associates tumor samples, or cell model systems, neighboring an underlying oncogenic state. This approach is accomplished in three-steps: 1) using isogenic cell systems to generate the oncogene activation signature, 2) decomposing the oncogenic signatures using non-negative matrix factorization and generating clustered transcriptional components, and 3) selecting a subset of transcriptional components to define the oncogenic states using the clustering method. Figure 1: Schematic Diagram of Onco-GPS. (A) Oncogenic activation signature is generated by expressing the oncogene of interest in an isogenic cell line. (B) The signature is decomposed into a set of coherent transcriptional components using a reference dataset (Cancer Cell Line Encyclopedia) (C) Transcriptional components are used to define the oncogenic states using the clustering procedure. (D) The transcriptional components and oncogenic states are characterized by associating each component against genomic and drug sensitivity datasets (Cancer Therapeutics Response Portal) and validating experimentally. (E) Integrated analysis and visualization of transcriptional components and oncogenic states (Onco-GPS map) are generated with samples projected. (F) Drug sensitivity to single agents or combinations are predicted using the drug sensitivity datasets and Onco-GPS map. These predictions are projected back to the map to refine the oncogenic states. This approach can be used to delineate functional-based oncogenic states that provide a more accurate biological “context” and molecular phenotypes to effectively match perturbagens to individual cancer samples. This strategy has generated over 20 candidate oncogenic states representing a “pan-cancer” group of solid tumors including lung, head and neck, pancreatic, liver, melanoma, prostate, breast, colon, ovarian, glioblastomas and medulloblastomas that will serve as the starting point of the project. A subset of pan-cancer oncogenic states will be selected as targets for thorough characterization to determine their most important genomic and immune hallmarks. The most promising synergistic combinations that target oncogenic states with the similar vulnerabilities can be validated experimentally and potentially facilitate the discovery of efficacious therapies and improved survival. Resistance to treatment emerges frequently with standard and targeted therapies. To overcome therapy resistance, a complete understanding of the tumor and its surrounding microenvironment is needed. It is postulated that a defined integral relationship exists between key oncogenic cellular pathways, the baseline cellular context, and the specific characteristics of the induced immune microenvironment, that ultimately drive cancers into a few states with similar vulnerabilities. Hence generating a detailed catalog of oncogenic states can be used to find optimal combinations of pharmacological and immunological perturbagens that disrupt cancer cells and their interaction with the tumor and immune microenvironments. The catalogue will be of great value to the cancer community to develop new therapeutics, clinical trials, treatment strategies, or provide the foundation for a new generation of functional-based, precision oncology approaches. Replication, validation, and relevance are all essential tenets of science. 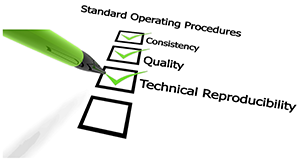 Standard Operating Procedures (SOPs) address the issue of technical reproducibility by providing clear, concise, and detailed instructions for execution of an experimental protocol. Rigor in designing and performing scientific research and the ability to reproduce experiments are only two of the goals that have recently been championed by the National Institutes of Health (NIH) and the research community. Commitment to these goals is evidenced by their inclusion in NIH grant application requirements and a collaboration with journal editors to revise publication guidelines to increase rigor and reproducibility as reviewed here. With these concepts in mind, a review of the importance of well-written, clear and detailed SOPs for projects, such as those supported by the Office of Cancer Genomics (OCG), is valuable and timely. It takes time and effort to develop precise and sufficiently detailed SOPs, but it is well worth the effort in the long-run since they reduce confusion, ensure reproducibility, and enable experimental progression. It is for these reasons that the OCG has developed Characteristics of Successful SOPs for OCG managed programs. The Characteristics of Successful SOPs document was developed based on review of several SOPs produced by OCG programs. A set of SOPs developed for the Cancer Genome Characterization Initiative (CGCI) is a useful reference when undertaking the writing of an SOP. This document includes SOPs to be followed when contributing samples and data to OCG large-scale genomic characterization projects. Characteristics of Successful SOPs first outlines the critical and organizational components to be included such as an informative title, an introduction that summarizes the protocol and its use, the scope and purpose of the protocol, safety precautions, a detailed equipment and materials section, important quality control considerations, and the procedure which contains specific details of the protocol, in the order in which they are performed. Emphasizing important points with the use of a box around bolded text. Organizing materials into sections based on the subset of protocols within the larger procedure (e.g. normal samples can be collected by a variety of methods and the materials for each method are included in separate sections for convenience). Incorporating tables that clarify multifaceted lists or processes. Adding a flow chart that clearly delineates the order of operations, especially for complex protocols. A careful review of the SOP, with emphasis placed on portions that may be difficult to follow, will provide awareness of sections that may benefit from extra explanation via tables, pictures, or flow charts. The importance of clear and detailed SOPs is underscored when considering the impact on the programs for which they are written. In the case of programs such as the Human Cancer Model Initiative (HCMI)—which will supply next-generation human tumor cultures to the research community—poorly written protocols can lead to downstream issues including the inability of cultures to be propagated, alterations in the culture genotypes and phenotypes, and ultimately the drawing of conclusions that may not be applicable to the original tumor. Patients donate their tumor tissue, clinical data, and time in the hope that others with similar cancers will eventually benefit. When samples are collected from these patients, it is essential that time and expertise are devoted to ensuring that the resulting models are distributed with SOPs that ensure consistent model propagation. These models will not be supplied in a vacuum; much effort will be expended up-front to provide the information necessary to ensure their successful and consistent growth. This begins with developing and distributing SOPs that are accurate, detailed, and sufficient for model propagation. Technical reproducibility is an initial step in addressing the validity and biological relevance of experimental results. As scientists perform procedures, they incorporate experience and assess how the protocol and results fit with prior knowledge, enable further understanding, and answer the intended question. The insight gathered when scientists perform established protocols is difficult to attain without a detailed and clear account of how the experiment was initially conducted. Thus, well-written SOPs are valuable components of the research process. Consistent methodology is the unheralded structural support for any high caliber scientific publication. Reproducible data relies on consistent methodology to remove any confounding variables. This is all the more important when multiple laboratories or sites are producing data that is meant to be compared and contrasted. Large scale genomic sequencing projects rely on multiple centers and many people to accomplish their goals. Colleagues from all participating sites must conform to consistent methodology for processing of samples in order to ensure consistency of data. Standard operating procedures (SOPs) are the hallmark for any working laboratory and/or large scale scientific project, because they provide a framework for reliable procedures in generating valuable data and covers all aspects of the project from beginning to the end. The Office of Cancer Genomics (OCG) Initiatives currently include two projects that are collecting tissues for large scale molecular characterization, the Burkitt Lymphoma Genome Sequencing Project (BLGSP) and the HIV+ Tumor Molecular Characterization Project (HTMCP). Multiple sites and personnel work on both projects which involve many moving parts. SOP manuals have been developed with protocols tailored specifically to the needs of those contributing tissues and other data for both the projects. Each SOP document follows similar formatting including a record of dates that the respective SOP document was created and dates of the subsequent updates. In addition, most SOP documents will have a structure that includes a title, introduction, scope and purpose, equipment list and the procedure which is written in the order in which the steps take place. SOP manuals for both projects have been developed according to standard templates that harmonize the processes for collection of human tissue utilized. However, there are also standard templates that are necessary for the use of human tissue utilized by both projects. These include templates with suggested language for both prospective and retrospective tissue collections to meet Institutional Review Board (IRB) requirements. Other general templates provided include material transfer agreements (MTAs) and Institutional Certification Letters (ICLs) allowing for the molecular characterization of tissue submitted to the project. While a participating tissue source site (TSS) does not necessarily need to use the templates to submit these forms, they are nonetheless made available for their convenience. In addition, since many of these documents are necessary for projects which include human tissue, these templates are made available through the OCG website and can be modified by anyone. Detailed clinical data is a requirement for any tissue to qualify for molecular characterization in BLGSP and HTMCP. Thus, enrollment and follow-up clinical report forms were tailored for BLGSP and each cancer subtype collected for HTMCP (Diffuse Large B-Cell Lymphoma, Cervical and Lung). These forms were developed with the help of the central pathology members using standard NCI common data elements (CDEs). The clinical report forms allow the projects to capture relevant CDEs while ensuring that submitted tissue does not have any disqualifying events such as prior anti-cancer treatment. Use of these standard report forms ensures consistency amongst the TSSs submitting clinical data and allows the site curating all clinical data to analyze any errors with ease. The ability to input clinical data electronically also helps both the submitting TSS and the curating site to note any inconsistencies and/or errors. SOPs act as living documents. While new approaches and procedures become available for researchers, the SOPs will require modifications to utilize advancing technology. 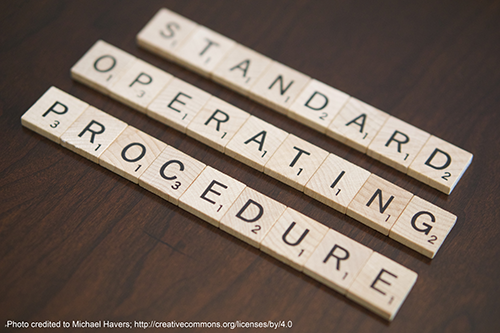 Updates to OCG’s SOPs are made every calendar year to ensure that the protocols are current. While many of these updates are small changes such as amendments to personnel contact information, larger updates require the modification of multiple forms. Clear communication between the program manager and the participating institutions is important when updating the SOPs so that any questions about SOP content can be further clarified. One of the most significant updates to both SOPs involved the inclusion of formalin fixed paraffin embedded (FFPE) tissue for molecular characterization purposes. While the original SOPs had allowed for the use of FFPE for central pathology purposes, they were excluded for molecular characterization due to their poor tissue quality compared to fresh frozen tissue. However, sequencing technology improvements have qualified FFPE tissue for molecular analysis within both projects. Thus, SOPs describing how FFPE blocks should be submitted to the project, while still emphasizing a preference for fresh frozen tissue, were generated and integrated into both SOPs. The ability to collect samples for which only FFPE tissue is available greatly expands the breadth of tumors that can be collected for these projects, benefitting the scientific community. As technology continues to improve, further updates will need to be made to reflect changes in methods at the tissue processing institutions. Other updates generally arise from questions submitted by TSSs aimed at clarifying instructions. Identifying questions that can be clarified by referencing the SOP manuals from those that may present future issues is paramount as a project manager so that updated SOPs help prevent ongoing procedural questions. Lessons learned from updating the OCG’s SOPs can also be applied in the development of new SOPs for other projects. Capturing the newest updates in molecular characterization techniques in SOP manuals such as using FFPE tissues for sequencing purposes allows other projects to develop SOPs with current technological standards. The OCG’s SOPs provide the necessary tools for participating researchers to produce consistent and accurate data. OCG will continue to adapt these SOPs to the needs of the participating TSS’s and other processing sites while meeting the standards and goals of the projects. 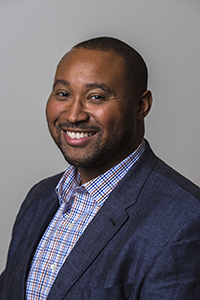 Greetings, my name is Freddie L. Pruitt III, Ph.D., and I am the Communications Manager for the Office of Cancer Genomics (OCG). My love for research started soon after stepping foot on my undergraduate campus. I pushed my way into the laboratory of new Assistant Professor fresh out of his post-doc. Keeping grounded in my course work while partaking in all the traditional undergraduate experiences, I used my time at the bench to satisfy my curiosity. My education started at the University of Delaware where I obtained my B.S. in 2004 and M.S. in 2008. My thesis work focused on understanding mechanisms of adhesion-mediated chemoresistance to Docetaxel by prostate cancer cells. I enjoyed my graduate experience so much that I furthered my education and technical training at Vanderbilt University Medical Center where I completed my Ph.D. in 2013. My thesis work examined the differential expression of estrogen regulated genes in the cancer-associated stroma which contribute to the promotion of tumorigenesis. Graduate school allowed me to indulge my interest in biology at a molecular level. That curiosity carried me through graduate school, to the Department of Oncology at Johns Hopkins Medical Center as a post-doctoral fellow. My research as a fellow focused on designing “molecular grenades” for metastatic prostate cancer. This novel drug delivery system involved delivering an inactive (pro) toxin to tumors in both primary and metastatic sties that is specifically converted to the active toxin by an enzyme exclusively expressed by the tumor and cells associated with the tumor. My entire research background is based in understanding the role of the tumor microenvironment in prostate cancer progression for identifying new targets for therapeutic intervention. That thrill of venturing into unknowns of science provided the fuel to drive me through the long days of graduate school and post‑graduate research. During my days in graduate school, I loved being at the bench and creating in vivo tumor models. Even when the project meant arriving to the lab during the wee hours of the morning or camping out late on a Friday to collect a data point. I enjoyed the scientific process with the hopes that this experiment would result in “the” figure which would grab the cover of a journal. Then I started my postdoc. The love of science was still there and I really enjoyed writing grants. What was not so exciting was the bench work and witnessing well-established principal investigators struggle to obtain new R01 grants, or the young investigators who were struggling to compete with the established investigators for the same pot of grant money. I had witnessed many talented academic scientists work very hard to get numerous publications and still not achieve that sought-after tenure track faculty position. I quickly came to the realization that academic research was not what I wanted to do for the rest of my life. But what happens when you still love the science, but no longer enjoy working at a bench? Over coffee one afternoon, I expressed my reservations with a colleague who directed me to check out positions with the National Cancer Institute (NCI). Thus, began the search for positions where a Ph.D., but not a pipette, would be required. Having an advanced degree in science means more than being able to design and run an experiment. Having a Ph.D. allots many other transferable skills: Budgeting, critical thinking, data analysis, writing and publishing, presenting, problem-solving, project management, and the ability to work within a team. These skills are effectively utilized in many fields outside of academia and serve important functions in our workforce. My search returned an opening in the OCG as a Program Manager of Communications. I ensure all of the scientific and administrative milestones of OCG communications are being met. I work to identify any resources needed to meet those milestones or roadblocks to overcome, disseminate information to the public about what this program does, and talk to the investigators supported by the OCG on a regular basis about the science. Having a strong scientific background, I am able to leverage my communications experience garnered from grant writing, giving presentations, and manuscript preparation to translate the progress and success of OCG supported investigators to the research community and engage non OCG supported investigators through social media. Being in communications allows me to continue talking with scientific investigators and thinking about science and the future of cancer research with the perspective of the big picture as compared with being a specialist focused on prostate cancer. Armed with the all the previously mentioned skills acquired during my training in cancer research, the transition to a position away from the bench is not seamless. The biggest challenge has been learning the ropes of how a government agency works. There have been a lot of things which I had to learn on the fly. As a trainee, I was given the freedom to direct the course of my research, basically working in a team comprised of one person. 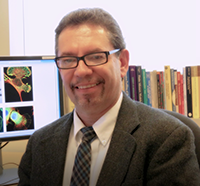 Coming to the NCI, I work within a team of multiple divisions with people across the National Cancer Institute. Working within this large team I have learned there is a hierarchy for moving projects forward that takes some patience when working towards completing a task. I have found the most rewarding part of serving as the OCG communications manager, is being the medium by which new information is disseminated to the field of cancer researchers. In collaboration with the public liaisons’ office, I have learned writing skills for nonscientific audiences. This is an invaluable tool for keeping the general population up-to-date with latest insights in cancer therapy, and new clinical trials initiated by OCG supported research. If there is ever a question about a resource supported by this Office or ways to improve the user experience for our website please feel free to reach out by emailing us at ocg@mail.nih.gov so we may start a dialogue.